Yet there are people with this perverse degree of moral blindness. Including the head of the European Commission. And the Prime Minister of Canada, who actually referred to the former dictator as Cuba’s “longest serving President.” I guess the boy wonder of Ottawa doesn’t understand that you can rule for a long time when you don’t allow free elections. Now you can understand why I am so quick to believe that he’ll say really stupid things. Almost nobody in the world would recognize the President of Ireland. But since he didn’t like the fact that Ireland’s economy boomed, it’s understandable that he is despondent about the death of a man who did so much to keep Cuba mired in poverty. And, of course, Jimmy Carter couldn’t resist showing why he was a one-term blunder. The nutjob leader of the British Labour Party predictably fawned over Castro with a series of laughably inaccurate assertions. I’m relieved, by the way, that Barack Obama resisted the temptation to say anything overly vacuous about Castro (even if he did say something stupid about Cuba’s totalitarian regime earlier this year). His statement is mostly mush. And even though I have my doubts about Trump, his statement hit the nail on the head. But let’s set aside Castro’s brutal treatment of dissidents and denial of basic human rights. Let’s ignore the fact that tens of thousands of people have risked their lives to escape his island prison. 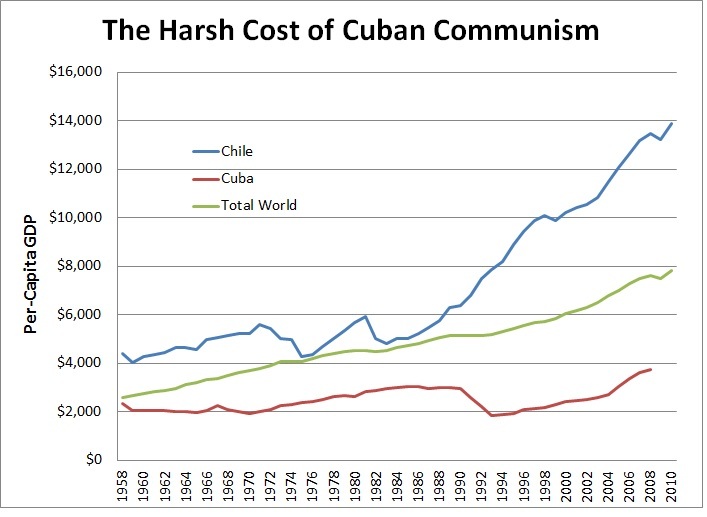 And let’s instead look at the economic misery of Cuban communism. In a column back in 2014, I noted that living standards in Cuba and Hong Kong were identical in the 1950s. But the two nations then conducted an experiment. Hong Kong chose laissez-faire capitalism while Cuba chose communism. 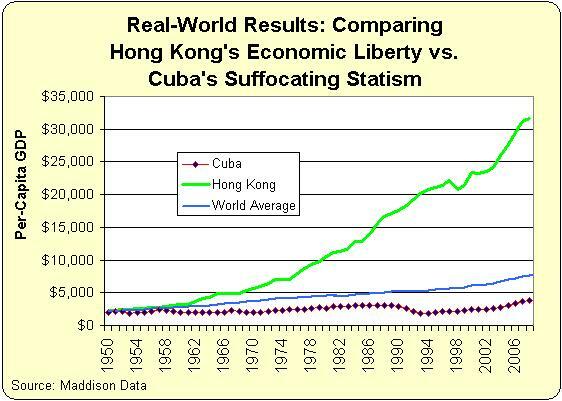 The result, as you can see in the graph, is that Hong Kong has enjoyed decades of strong growth while Cuba has stagnated. I’m not alone in noticing the onerous economic cost of Cuban oppression. This academic article has a devastating summary. We examine Cuban GDP over time and across space. We find that Cuba was once a prosperous middle-income economy. On the eve of the revolution, incomes were 50 to 60 percent of European levels. They were among the highest in Latin America at about 30 percent of the United States. In relative terms, Cuba was richer earlier on. Income per capita during the 1920s was in striking distance of Western Europe and the Southern United States. After the revolution, Cuba slipped down the world income distribution. Current levels of income per capita appear below their pre-revolutionary peaks. Now let me make a new contribution to the discussion. I went again to the Angus Maddison database and decided to compare historical numbers for per-capita GDP, looking at Cuba, Chile, and the world average. As you can see, Cuba has been a disaster for ordinary people. Living standards used to be near the world average. Now the average Cuban is at half the world average. Meanwhile, Chileans also had a period of stagnation during their era of statism. But once free-market reforms were adopted, the notion started a lengthy boom and per-capita GDP is now almost twice world average. That’s the real-world consequence of statism. Deprivation and hardship. To get an idea what it’s like in a communist prison nation, slaves in the 1800s actually got more food than what Castro allowed when the government took control of food production and distribution. The good news, so to speak, is that the rationing has moved from starvation levels to hunger-and-misery levels. The Guardian has a summary of the current system. Every Cuban family registers with a local supply store, where they can use a libreta or ration book. This typically provides about 10kg (22lb) of rice, 6kg of white sugar, 2kg of brown sugar, 250 millilitres (1 cup) of cooking oil, five eggs and a packet of coffee per person per month, along with 2kg of meat (usually chicken) every 10 days, a bun every day and a bag of salt every three months. Milk is provided for pregnant women and children under seven years of age. The basic libreta products are guaranteed, but they are not enough – so people often have to travel to several places on several different days to make up the shortfall. Not as bad as 1962, but still a miserable life. Here are portions of a very appropriate obituary in the Washington Post by a Yale professor. One of the most brutal dictators in modern history has just died. Oddly enough, some will mourn his passing, and many an obituary will praise him. Millions of Cubans who have been waiting impatiently for this moment for more than half a century will simply ponder his crimes and recall the pain and suffering he caused. …deceit was one of Fidel Castro’s greatest talents, and gullibility is one of the world’s greatest frailties. …Many intellectuals, journalists and educated people in the First World fell for this myth, too — though they would have been among the first to be jailed or killed by Castro in his own realm — and their assumptions acquired an intensity similar to that of religious convictions. Pointing out to such believers that Castro imprisoned, tortured and murdered thousands more of his own people than any other Latin American dictator was usually futile. His well-documented cruelty made little difference. He highlights 13 reasons to despise Castro. Here are the one that stood out to me. And the Caracas Chronicles also summed it up nicely. Has any other Latin American done as much damage in a single lifetime as Fidel Castro? It’s…not even close. From his roots as a student gangster and two-bit murderer in Havana in the 40s, through a succession of catastrophes on four continents, Fidel Castro punched far, far above his weight. The guy who pleaded with Khrushev to start a nuclear holocaust, who sent tens of thousands of Cuban farm kids to dole out lead in a crazy, murderous war in Angola, thousands to attack Israel in the Yom Kipur War, thousands more to stand with the genocidal communist Mengistu regime in Ethiopia, who tried and failed to destabilize Bolivia, Argentina, Venezuela, el Salvador, Congo, Sao Tome and Principe, Guatemala, who tried and succeeded in destabilizing Nicaragua, Chile, Granada and — alas — Venezuela is finally, finally dead at 90. Keep all this in mind the next time you hear some leftist says something nice about Castro. Or the racist murder Che Guevera. P.S. For what it’s worth, Castro did have a late-in-life epiphany about the failure of communism.